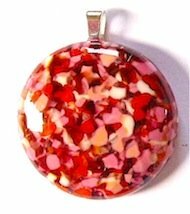 Glass frit blends offer a wide variety of colors for use in fused glass jewelry. Blended frit can be made from scrap glass or purchased in a wide variety of blended colors. The blends in the photo are COE 96 and represent a very small sample of the glass available. This glass is an ideal size for fused glass jewelry making. This type of glass is not cheap but not much is needed to produce an original fused glass jewelry design. Frit can be made from scrap glass by cutting it into small pieces and then placing it between sheets of newspaper and hitting it with a hammer until the desired size is reached. Always wear safety glasses when using this method. Place glass in a small strainer and rinse under water to remove any dust, allow to dry before use. Frit can also be made with a Aanraku Frit Piston which is a special hammer for breaking glass for frit. Depending on what you wish to do, just cutting small pieces with a glass cutter may be enough. Grozing pliers or mosaic wheeled nippers can also be used to produce small pieces. Frit sifters can be used for sorting and grading crushed frit. When used with jewelry the frit can be fused into a piece of glass and basically retain its shapes per the photo, as can be seen the frit is clearly defined. The pendant has a clear cap which adds depth to the design. If it is fused at fused at a high temperature and allowed to melt across the base glass then the frit will melt fully. The pendant in the photo has been fused at high temperature in the glass kiln to achieve fully blended appearance. The same blend was used for both pendants, the outcome shows the difference between glass fusing methods. Different frit blends will produce original outcomes, using decals with frit can result in very special art glass jewelry designs. Experimenting with frit will result in a large range of design options, particularly when combined with dichroic glass and decals.